Pikes Peak summit last night at 6 pm. Click for current view. It’s still pretty warm in the Denver metro. Lots of days in the 90s, though more often now in the 80s. But there’s hope in them thar hills. Some of the peaks have been getting snow this week. 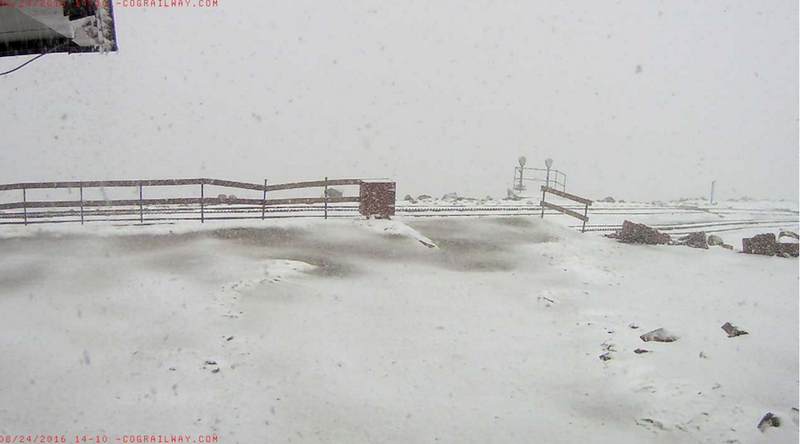 These screenshots from Pikes Peak webcams show the snow up there last night and this morning. It’s the third time in a week for snow on the summit. I don’t know how tourists feel about it when they get up there. Snow in August is probably a novelty for out-of-staters … unless they were hoping for the typically great view from the 14,114-foot summit. Pikes Peak summit rail stop this morning. Click for current view. P.S. This was a few minutes ago, at 2:11 pm. Whee! As ever, a lovely shot from you. Thanks. But the credit goes to those who own and maintain the webcams. All I do is spend waaay too much time looking at them. Don’t laugh. I’ve seen it happen several times. There are always snow patches up on Trail Ridge Road and often there will be a small snowman next to them. And I remember quite well how, as a child, I loved getting snowed on in August (when there were 100-degree days back home). Do you actually have trains running to the top of the mountain? Yes, on this particular mountain. It’s a cog railway, meaning it has cogs that grip a track between the rails because the slopes are so steep. During the day, if you check the railway webcam, you’re very likely to see a red train stopped there. If there’s no train, you can see the tracks. There are lots of pictures on Google. The Wikipedia article goes into more detail, history, etc. And by the way, the train runs year ’round. You know, I’ve never ridden the train. Have driven up every time I’ve gone. I must try the train one of these days. Well, you’re helping to encourage them to spread out, kudos. Uh oh, not bad I hope. My sister and her hubby are en route right now to a spot on the Oregon coast where they spend a month every fall.